One of the more frequently found animals that can become pests in Spring, Texas is the opossum. The common opossum and the Virginia opossum are two of the most familiar types of opossum species. They have a cone-shape, pink-tipped nose, and a long hairless tail. Their fur color is usually white, black and gray. Opossums remain the only species of marsupial in North America, including Spring Texas. They are about two to three feet long and weigh up to thirteen pounds. The opossum can be found in the US, Central America, Mexico, South America and Canada. They aren’t particular about their habitat, but they prefer marshes, swamps, streams and living high in trees. They are immune to snake and insect bites. 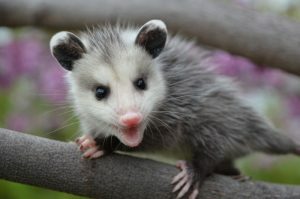 The plentiful opossum may choose to live in your yard, your garage and may even be found in your house in Spring TX, too. Opossums prefer hunting at night and sleeping during the day. While these furry creatures don’t hibernate, they do slow down quite a bit during the colder seasons. They build burrows for themselves and fill them with soft items such as torn paper and dry leaves. Opossums can be a pest because they love scavenging through garbage, and eat nearly anything. Opossums also eat wild foraged food such as insects, birds, snakes, chickens, and mice as well as clean up any roadkill available. Opossums breed two times per year. It only takes about 13 days until the babies are born. Opossums can have up to 20 babies at a time. The jellybean-sized babies, called joeys, move from the mother opossum’s birth canal opening to her pouch, where they continue to grow. You may see a mother opossum carrying her babies around on her back. The joeys are old enough to leave their mother at about 100 days old. These baby opossums have a notoriously low survival rate, so not that many of them live to maturity. Opossums can reproduce at six to eight months old and only live for about two years. Opossums have thumbs on their paws, enabling them to get into places that many where many other animals cannot enter. They can use both their paws and tails to hold onto tree branches and help them climb, too. As you can see, opossums reproduce prolifically and have large broods of young. If you see one opossum on your property, you can bet that there are more of the furry creatures hanging around in your yard, in your garage, in your outbuildings and perhaps even in your house in Spring Texas. Opossum may be a danger to your chickens and bring disease with them if they move into your property. Opossum infestations can be taken care of by us. Our company offers humane trapping, relocation and opossum removal for its customers in the Spring, TX area. We can also keep your property from continued visitation and habitation by the persistent opossum.